Interesting post I find my self in agreement with. The Rules Compendium for DD 3.5 acknowledges this on a sidebar, and I think it cites the board game Cosmic Encounter as an early example of such design. So I guess your Magic: The Gathering comparison is pretty accurate. I don’t know. I think the trend starts well before the era of Magic: the Gathering. 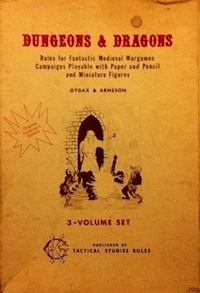 Just from AD&D you have druids and their myriad of abilities and sub-systems, thieves and their skills, bards you mentioned, paladins and the mishmash of things they receive, the pseudo-skill system, and rangers. Now, I don’t have any experience with Vampire: The Mascarade or any of those games, but looking at the games I have played outside of D&D, mostly D6 Star Wars and lots of Palladium games (RIFTS, Palladium Fantasy, Ninjas & Super Spies, Heroes Unlimited, and Robotech), and with the exception of D6 Star Wars, they follow similar patterns. New skills and abilities gained as you level up. Lots of sub-systems and exceptions. It seems to me that the process and proliferation of sub-systems and exceptions started much earlier than the Magic era. I think with the initial design of 3E, there was better recognition of the sub-systems for what they were and a much more intentional approach to design with regards to them. In fact, I think (and I could be completely wrong) that the design of a lot of games in the 80’s and 90’s was in response to the mishmash of rules and systems that various versions of D&D had become. Lastly, I don’t see much of a difference between a monk gaining a new ability and a wizard gaining a new spell. They are both essentially something new that the character can do. I think you’re right about the cognitive load effect; it’s not something I particularly enjoy in a game nowadays. I want to focus on the in-game, not a long list of rules I can invoke. I want a character sheet I can fill out in under 20 minutes without stressing. It seems plausible that Magic the Gathering (and all that flows from it) was a significant driver for this shift. I think other important influences include computer games, most obviously CRPGs, but also many other strategy-type games (in turn influenced by developments in PC hardware, programming languages and methodologies), the board game renaissance of the 1990s (driven by… ). But as another said, the drive to add more game content (in this context more character options) is visible in the early days of D&D (e.g. Dragon Magazine and the early supplements). This in turn must have been influenced by both the pre-existing DIY spirit of the wargaming hobby and commercial imperatives to a) promote interest in and talk about the product; b) sell new publications (most evident in the Module publication strategy of the following phase, but surely present in the supplements). Fundamentally, I think this pattern feeds on the audience’s desire for novelty. It is probably also worth acknowledging that much of that RPG content is functional as inspirational reading even if it never hits the table. Or put in other words, there are ways to use RPG materials beyond playing them directly.